Bullfrog Spas unveils new Milton, Ontario warehouse which will help get spas to Canadian hot tub dealers and customers faster. We couldn’t be happier to hear about Bullfrog’s new warehouse. This effectively increases my inventory by 4 or 5 times and lets me get my customer their spa in days instead of weeks. Bullfrog International, manufacturer of portable hot tubs with patented modular technology, announced a new warehouse in Milton, Ontario, Canada today. This warehouse is intended to increase delivery efficiency and to decrease customer wait times for spas purchased from Authorized Bullfrog Spa Dealers in Eastern Canada. 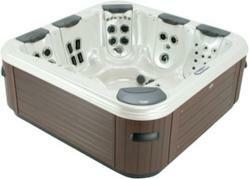 The warehouse is stocked with hot tubs in the most popular models and sizes. Any Authorized Bullfrog Spa Dealer will be able to order from this inventory and get spas to their customers faster. Bullfrog Spas is the fastest growing spa manufacturer and continues to expand its presence in Canadian hot tub markets. Danielle Lavallee-Wasson, International Sales Director for Bullfrog Spas expressed her thoughts on what this means for Bullfrog Dealers in Canada: "Opening this warehouse in Milton, Ontario will allow us to better serve our dealership base as well as attract new dealers who will know that this new venture is another move that shows our firm commitment and support of our Canadian clientele." For customers looking for a specific custom hot tub model not stocked in the Ontario warehouse they may still order with their Authorized Dealer and have their spa shipped from the factory to their Dealer’s location. For any questions on Bullfrog’s new Canada warehouse feel free to contact Bullfrog Spas at info@bullfrogspas or by calling 801.565.8111. Bullfrog executives, including founder and President, David Ludlow, are available for interview.